(Trent Nelson | The Salt Lake Tribune) BYU slugger Bridget Fleener, the 2018 West Coast Conference Freshman of the Year, is one of the reason hopes are high for the Cougar softball team this season. Provo • BYU softball coach Gordon Eakin is convinced that he has enough talented players for the Cougars to make the NCAA Tournament for the 15th straight year and win a conference title for the 11th year in a row. Now it is a matter of getting the Cougars game experience against the best competition possible. Eakin, a former University of Utah baseball player who is entering his 17th season at the helm in Provo, proved prophetic last weekend as the Cougars went 1-3 at the season-opening Puerto Vallarta College Classic in Mexico, losing a pair of one-run heartbreakers. They opened with a 4-3 loss to No. 9 South Carolina before knocking off No. 18 Baylor, 4-3. 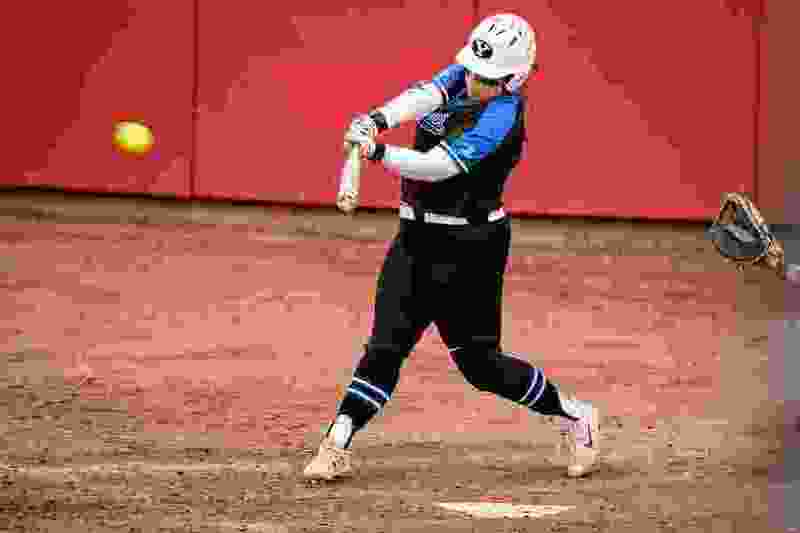 They came out flat Friday in a 13-3 loss to Liberty, then took a 4-1 lead over North Carolina on Saturday before giving up a three-run homer in the fifth inning and falling 5-4 to the Tar Heels. Junior outfielder Rylee Jensen and junior infielder Emilee Erickson made the all-tournament team. Jensen and senior utility player Ashley Godfrey drove in four runs apiece and Erickson, Godfrey and infielder Allie Hancock hit home runs. Sophomore Arissa Paulson picked up the pitching win against Baylor. The Cougars, who went 37-22 last season, 13-1 in the West Coast Conference, are picked to win the WCC again. Eakin uses the program’s success in reaching the postseason as a big selling point when he’s on the recruiting trail. Five starters return, including catcher Libby Sugg, a third-team All-American who finished seventh in the country last season with 67 RBIs. Sugg made the preseason All-WCC team, along with senior Lexi Tarrow, Jensen (the 2018 WCC Player of the Year) and sophomore Bridget Fleener, the 2018 WCC Freshman of the Year. BYU pitchers Autumn Moffat, a sophomore, and Kerisa Verimontes, a junior, also made the preseason all-conference team. Among the new players the Cougars will count on are Taylei Williams, a transfer from Southern Utah, and Alyssa Podhurcak, a freshman from Torrance, Calif. Williams doubled and scored two runs in Mexico. Eakin is also expecting contributions from sophomores Marissa Chavez and Erin Miklus. “Our strategy is to play a very strong schedule and put our players up against the best teams in the country, the storied programs in the country, so we are ready once we get to the NCAA Tournament,” Eakin said. The Cougars play their first home game March 26 against Utah Valley. They head back out on the road this week to play in the DeMarini Desert Classic in Las Vegas, opening against Fordham on Thursday at Eller Media Stadium. They will also play Hawaii, UC Davis, Georgetown and UTEP in the three-day event.